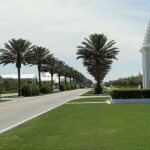 Alys Beach is Hwy 30a’s newest and most unique community. As you are driving East along Scenic 30a, you definitely know when you have entered Alys Beach, with the towering Palms lining the neatly manicured greens, and the stark white monument style buildings standing tall along 30a. Inspired by Greek Bermudan and Antiquan architecture, Alys is like a luxurious oasis of brilliant white stucco homes splashed with colors in the shutters, doors and copper gutters. Alys Beach’s Caliza Pool is recognized as the most luxurious infinity edge pool in the area and offers nigh time dining and live entertainment with a Moroccan flair.